Cash drawers are one of the core components to every Point of Sale System. They may be the simplest part of your POS but making sure you have the right one is key. Most drawers are printer driven and will need the right cabling to connect to your receipt printer. 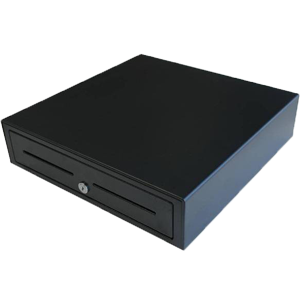 Black VPOS small cash drawer with solid steel construction and contains 5 note holders, 8 coin slots and 2 cheque slots. Uses steel runners and derlon rollers, 24V solenoid and 1.6m cable. Has a RJ12 plug (standard receipt printer connector). The Nexa Black CB-900 5 Note 8 coin Cash Drawer with RJ11 Connector to suit Epson TM-T88 printers and similar is the best value drawer on the market. It's all metal construction with metal note clips media slots 3 position lock makes it hard to go past. Black VPOS extra small cash drawer with stainless steel front and solid steel construction. Contains 4 note holders, 8 coin slots, 2 chque slots and uses steel runners and derlon rollers, 24V solenoid, 2m cable and RJ12 plug (standard receipt printer connector).